I love the desert in the spring when the wildflowers are blooming. It’s been a few years since we’ve had a decent wildflower bloom here in SoCal, but some consistent rainfall this past winter has once again brought carpets of color to the desert floor. 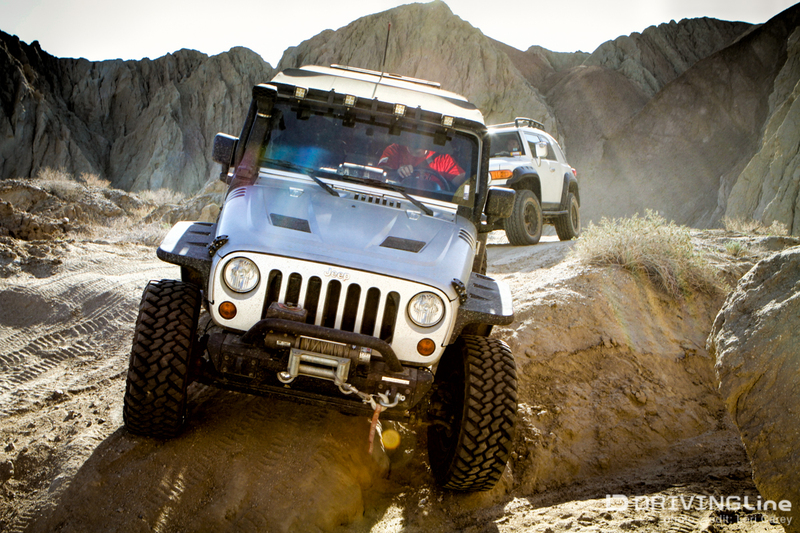 When my good friend Brett Woods, owner of JeepSWAG/Dominion Off-Road, called me and offered to lead a trail run through the Borrego Badlands the day after Tierra del Sol’s Desert Safari for the Warriors who were also going out with 4 Wheel To Heal, I did a little happy dance. 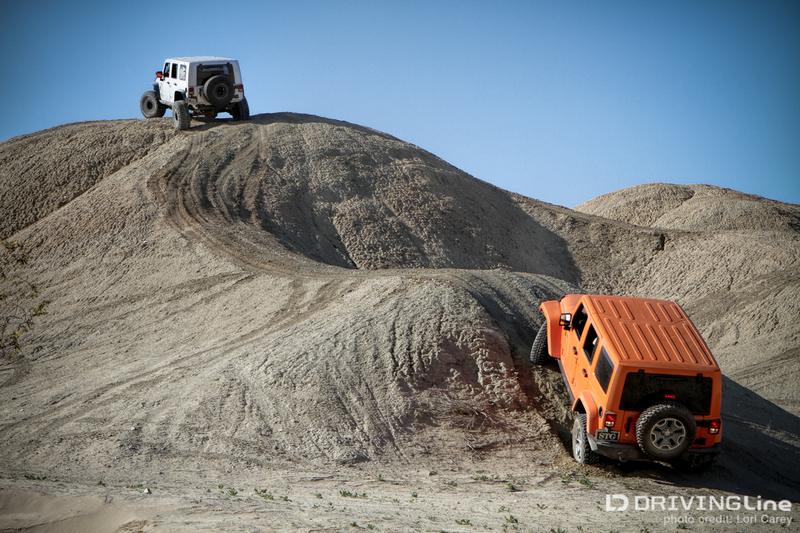 I understand the logistical reasons why off-road events are always held in Ocotillo Wells/Truckhaven, but as challenging and fun as the mud hills may be for some, they aren’t very scenic. 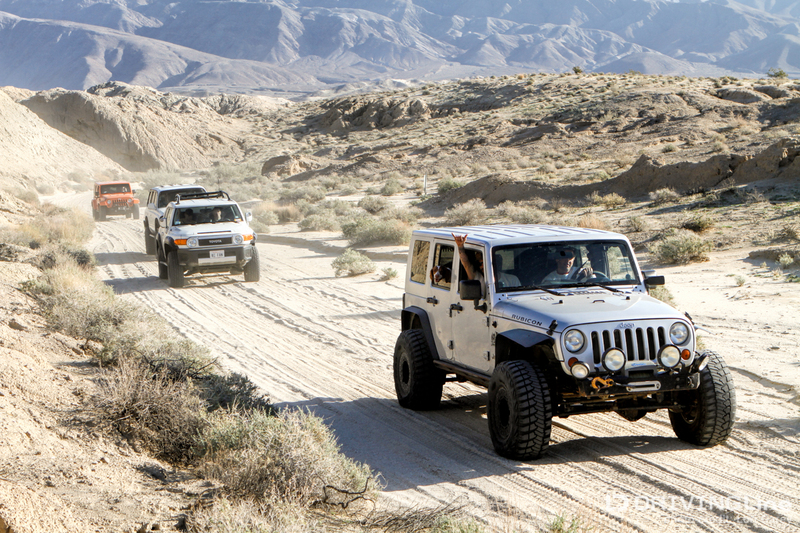 Just a few miles up the road is the vast Anza-Borrego Desert State Park, California’s largest state park and the second largest in the country, with many miles of beautiful 4x4 roads. 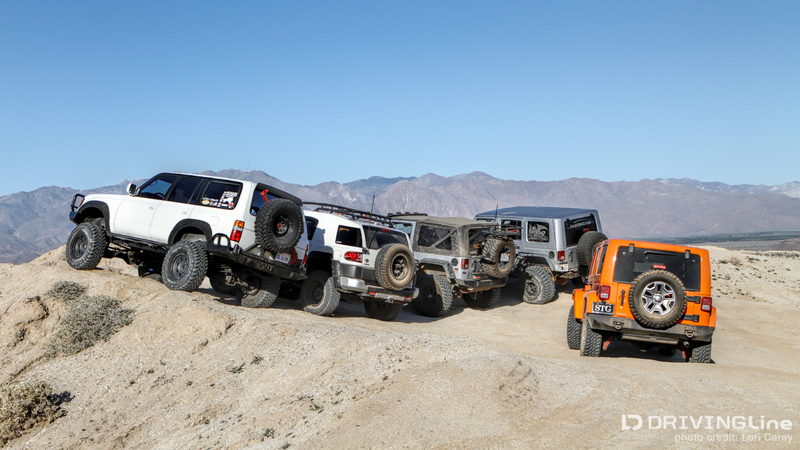 I confess that every time I attend an off-road event at Ocotillo Wells, I secretly wish I was a few miles up the road. We forgot that the clocks would move forward an hour overnight and we stayed up way too late around the campfire the night before the run. Dragging ourselves out of bed to grab a quick breakfast before meeting up with Woods at 7:30am was painful. 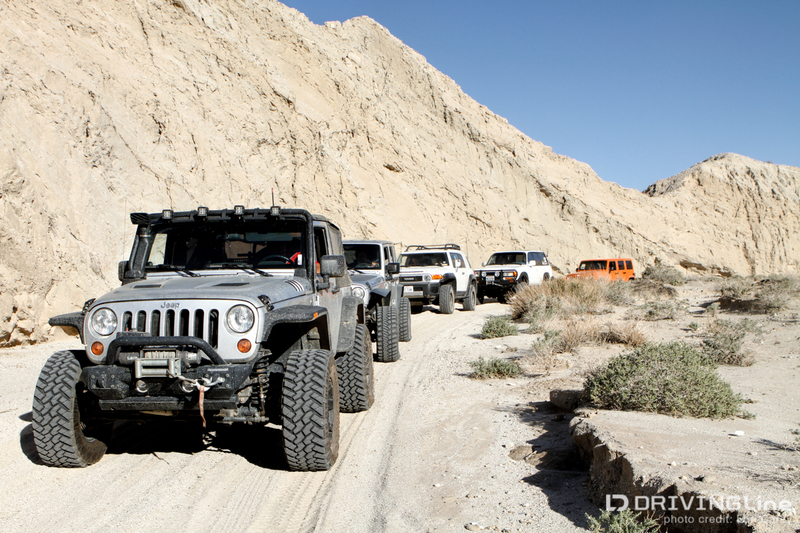 We were slow-moving and disorganized, but finally managed to get lined up and on the road to Inspiration Wash. Inspiration Wash is one of several wash trails off the Borrego-Salton Seaway (S22). The trail begins as a wide and flat sandy wash, and any SUV can do this section if the driver knows how to drive in deep sand. 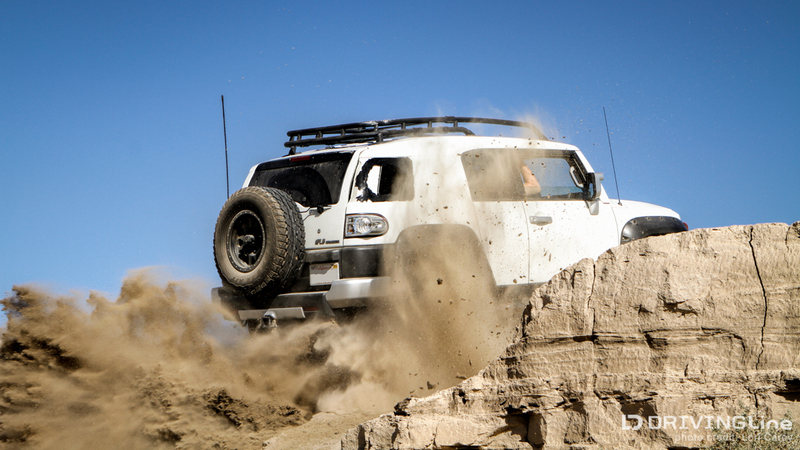 The road condition is currently rated as “Poor” on the Park’s Dirt Roads Condition Report due to the deep sand at the beginning and the 4x4 conditions later on the trail. We drove south for about three miles until we reached Inspiration Point, a scenic spot overlooking the western portion of the Borrego Badlands, a fossil-rich contorted maze of mud hills, narrow sandstone passages and sinuous s-curves created by years of water and wind erosion. 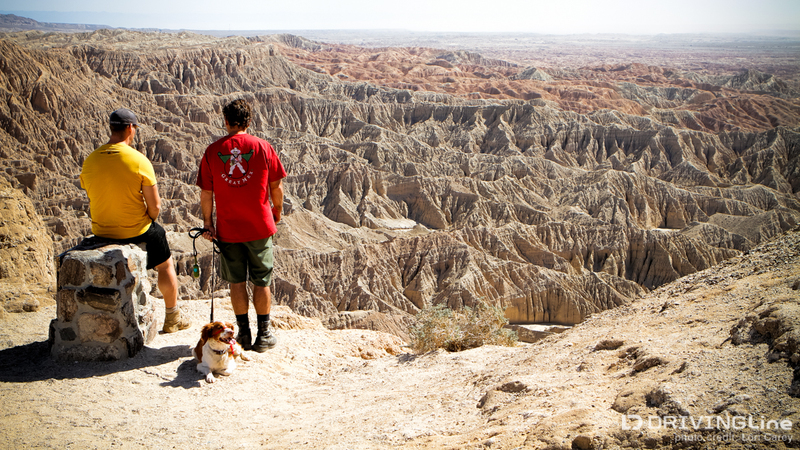 We stopped to enjoy the view, let the dogs stretch their legs and grabbed a couple of photos before heading west down the steep and narrow trail into the badlands. The lower section of the trail is known as Dump Trail, named because it terminates near a local landfill. Although the trail can be rough in spots and 4WD is strongly recommended, the only truly technical obstacle we ran into was a huge boulder that had fallen and was blocking our way. 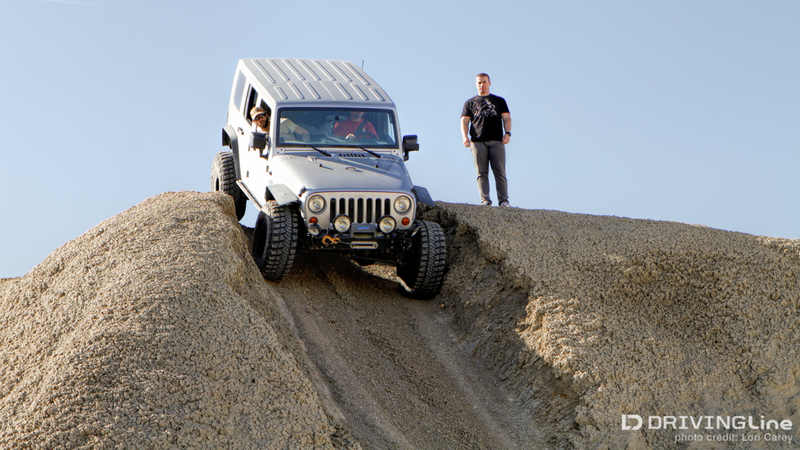 Woods showed off his skills and his Jeep’s capabilities by driving over the boulder. The next driver up tried to sneak around, but that didn’t work out as planned and he ended up having to drive up the ledge to pass on the high ground. The rest of the group chose to take an alternate route over higher ground. We wound our way through the wash until we reached a mud hill play area and had a little fun. 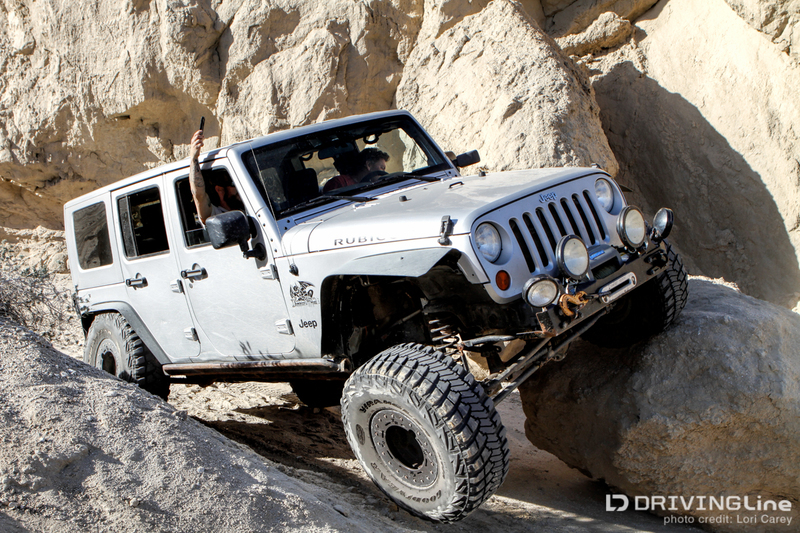 Further along the trail are some blown sand dunes for a different kind of challenge. 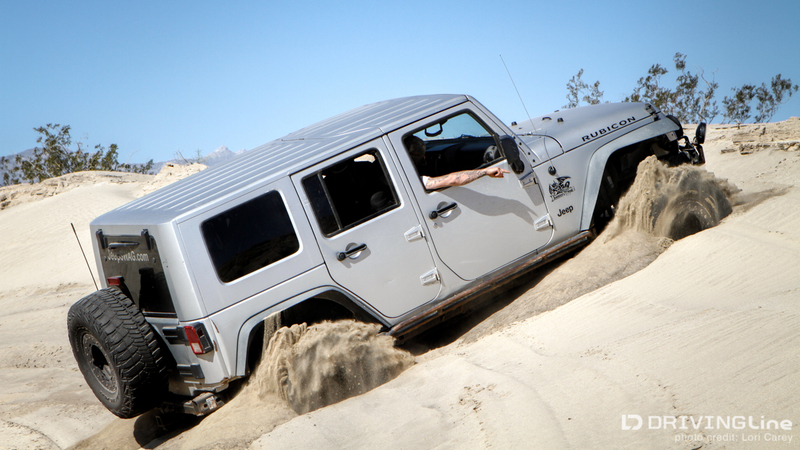 I thought that surely someone was going to bury an axle as I watched everyone try to make it up the short dunes. 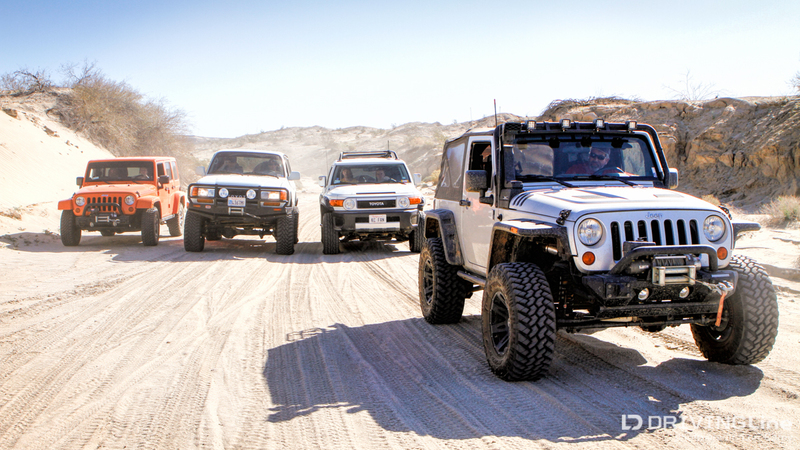 While no one did it easily, they all successfully conquered the sand. 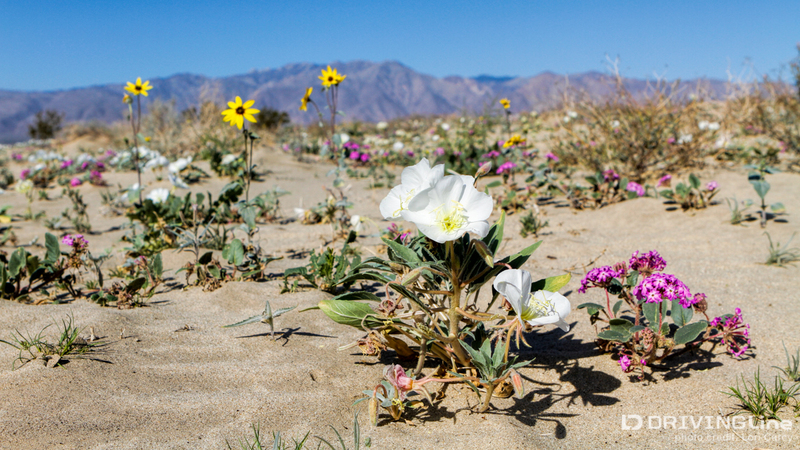 The sand dune area was covered with an assortment of wildflowers - if you have time to spend, it would be a great location for wildflower photography. Here we have Desert Sunflower, Dune Primrose and Sand Verbena. Of course we didn’t drive where flowers were blooming! This area borders the Old Springs Open Space Preserve so it’s important to stay on the trail. The guys don’t care much about the flowers, but I love seeing the desert in all her beauty. All too soon we were back on pavement - since it was still early in the day, we decided to circle back around Pegleg Road and the Borrego-Salton Seaway to Fonts Point Wash, a 4-mile wash trail that leads to Fonts Point. The wide flat trail is easy enough for anyone who knows how to drive in deep sand, not to mention a short drive to a parking area for the quick hike to Fonts Point. 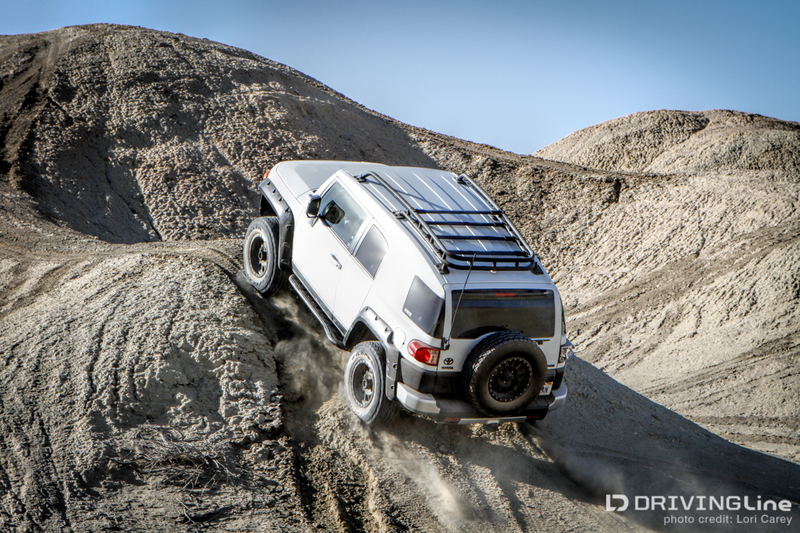 4WD is recommended because of the loose and sometimes deep sand. I’ve driven this short trail more times than I can count and it is constantly changing; some days a car could get out there with no problem, other times I’ve had to put my Jeep in 4WD and it was still a lot of work to keep moving. The Road Condition Report lists it as "Poor" due to soft sand the entire length, but I found it to be easier to drive than it has been the past few times I've been out there. I'm sure that the rains we've had this winter have helped firm it up a bit. The trailhead is marked with a sign on S2 and is easy to find. Fonts Point is likely the most scenic viewpoint in the entire park and is a popular destination because it is fairly easy to reach. It overlooks the Borrego Badlands to the south and the east. The Salton Sea is visible to the left, and on a clear day one can see into Mexico. The view into the Badlands is amazing any time of day, but it is breathtaking at sunset when the sandstone ridges take on amazing colors. There is usually a good crowd of people out here for sunset on the weekends, especially photographers. 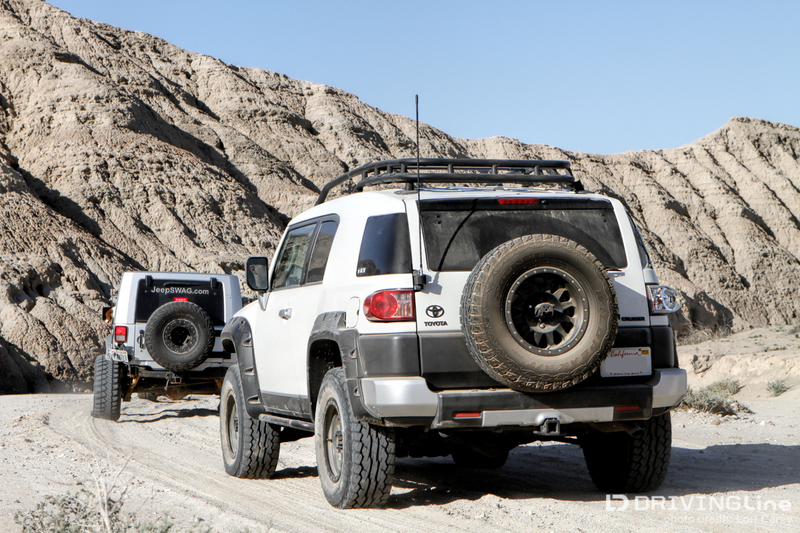 We worked up a good appetite with all of the hiking and wheeling, so it was time to air up and head back to camp for lunch. This is my approximation of where the two trails are, with no guarantee that it is 100% accurate - because the area is a maze of twisting slot canyons. 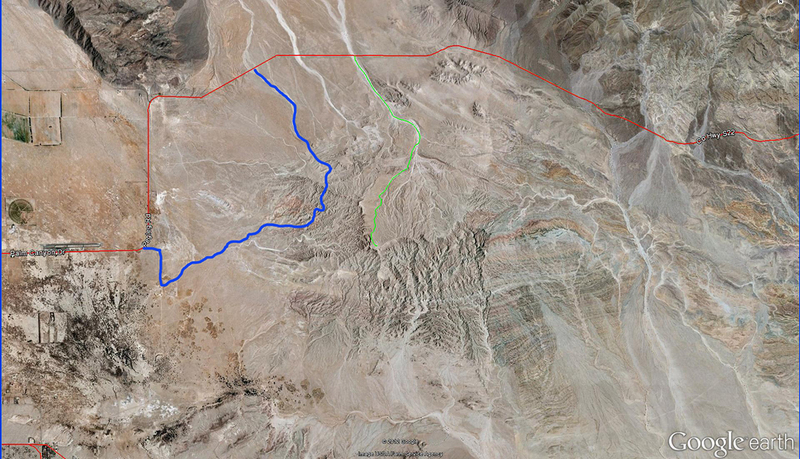 The blue line is Fonts Point Wash and there is a sign for the trail on Borrego Salton Seaway (S22) near mile-marker 29. The green line is a “best guess” for Inspiration Wash. It is west of the entrance to Fonts Point Wash. There is a sign for the trail but it is not visible from the main road. The coordinates are 33°18'13.0"N 116°15'18.1"W. There is a decent trail map available on the park website that shows the general location of the trails, but it does not have coordinates.